NMM 4575. Bass drum by William Kilbourn, Albany, New York, 1864-1869. Paper label inside shell: WILLIAM KILBOURN; / (SUCCESSOR TO GEORGE KILBOURN,) / MANUFACTURER OF / BASS AND SNARE DRUMS / TAMBOURINES, BANJOS, TOY DRUMS & C. / ALSO MANUFACTURERS OF THE / PATENT GUITAR BANJO / NO. 7 CLINTON AVENUE / ALBANY, N. Y. 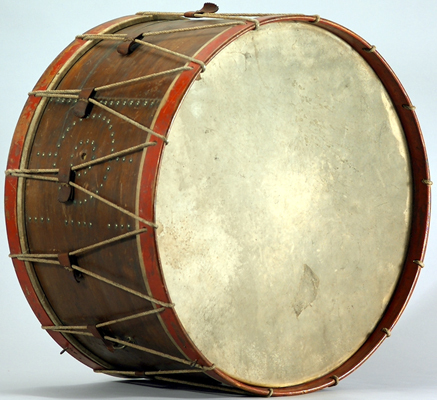 Maple shell, 440mm (18") x 715mm (29"). 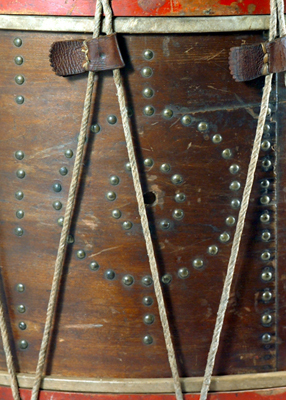 Brass tack design reinforces glued shell overlap. Design consists of two circles around the vent hole and three lines parallel to the seam, the middle line intersecting the center of the circle. Twelve leather tugs. Wood rims painted red with drilled holes through which the rope passes. Arne B. Larson Estate, 1988.